The fame and value of the northern haulage dogs has long been acknowledged, with many remote areas having their own version to meet their particular needs. 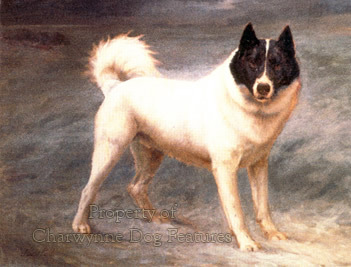 In this way, you can read of the Mackenzie River Dog, the Klamath-Indian Dog, the Baffinland Husky, the Toganee, the West Greenland Husky and the Kingmik. 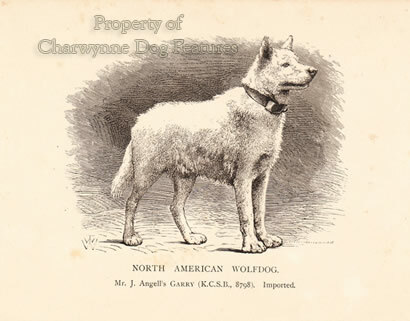 The North American Wolfdog or Timber-wolf Dog came from an outcross to the wolf to increase pulling-power but their aggression lessened their use, except as lead-dogs. 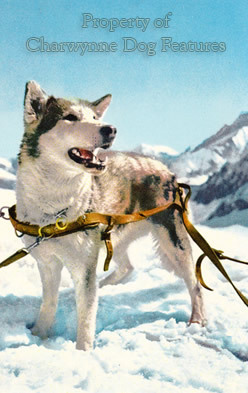 In Russia, the North-easterly Hauling Laika was the favoured sled-dog of the most extreme eastern part of Siberia. 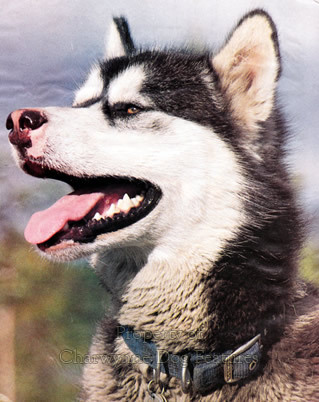 In North America, in due course, as sled-racing became popular, breeds like the Chinook, the Aurora Husky, the Huslia Husky and the Kugsha Husky emerged, with the latter specialising in heavy weight pulling. The nomadic Indian tribes of North America also used 'travois dogs' to pull loads on pole-ends dragging along the ground instead of on ski-like runners. This once gave us the now long-lost Hare-Indian Dogs, the Plains-Indian Dog and the Sioux Dog. There is something very special about this group of dogs, they display a definite 'presence'. I have seen a Chinook that was so majestic that it simply took your breath away. As a type of dog, this whole spectrum of types and breeds, deserve our admiration for their past feats in support of man. The use of dogs in the frozen north has long fascinated those of us living in warmer, more hospitable climes. The canine support for arctic expeditions has been extraordinary, with many being entirely dependent on dog-teams as an essential unmatchable transport-system. Ponies too played a role but the sled dogs underpinned most polar expeditions. Their quite remarkable endurance of those conditions, allied to their astounding feats of haulage, exemplify yet again dog's unique contribution to man's activities in every century. The canine polar role demanded not just the power and stamina to haul a sledge day after day across frozen unforgiving terrain, but the ability to withstand extreme temperatures and perform exacting duties without losing too much energy in doing so. Of course those dwelling in arctic places, such as North America and Siberia, bred dogs that could meet these demanding criteria, seeking dogs that were not too huge as to need undue feeding requirements but having the construction and the coat to allow them to succeed. Such dogs had to have superb feet, weatherproof coats, massive amounts of stamina and great strength of mind and body. Exhausted dogs die, poor hauliers don't survive and dogs lacking the fundamental qualities have no value to the people living in or travelling through such a challenging climate. 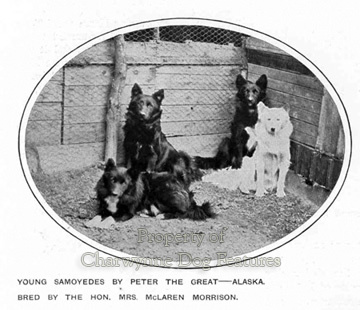 Some estimates have suggested that there were around 20,000 Canadian Eskimo Dogs alone in the 1920s, but only 200 some fifty years later. Traders in sled dogs had to breed them to cope with their extreme role and made judgements from their hard-earned experiences. They learned to value economy of motion in their dogs; their gait leading to success, a smooth motion in which their feet hardly leave the ground. Today the top sled-racing teams cover a mile in just over 3 minutes. This capability is rooted in the size-to-weight ratio. The dogs pull by pushing forward and the heavier the dog the greater the energy required to do so. A 50lb Alaskan hybrid husky has evolved as the optimum sled dog. Of course such a dog has to have the right feet, coat and constitution to support its work, but the relationship between height and weight is the key. This is why Eskimo Dogs, Greenland Dogs, Samoyeds and Alaskan Malamutes all have the same conformation - each one looks like a sled dog. The breed differences will rely on Breed Standards to identify each breed without seeking to degrade this functional basis. The Breed Standard of the Alaskan Malamute asks for a heavily-boned dog; I suggest they are after 'strongly-boned' rather than heavily-boned. Heavy bone is a liability to any dog as some mastiff breeds demonstrate all too vividly today. 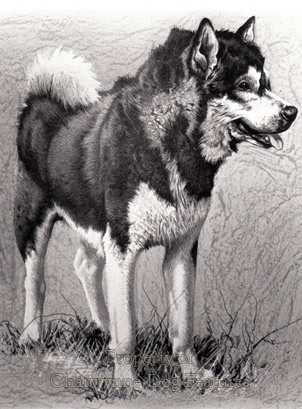 The Canadian Eskimo Dog's standard asks for a dog built for long distance work, not for speed like the lighter Siberian Husky, proposing a weight-pull capacity of 45-80kgs over 15-70 miles a day on snow, or carrying 15kgs as a pack dog in summer. The Siberian Husky's standard however expects the breed, much less precisely, to be 'never appearing so heavy or coarse as to suggest a freighting animal, nor so light and fragile as to suggest a sprint-racing animal'. There is a suggestion there that the Malamute is heavy and coarse. 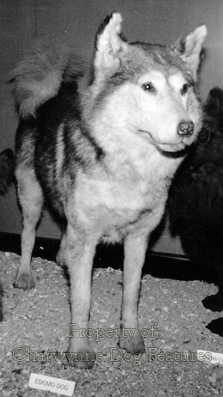 The Greenland Dog has to be similar in general construction to the Alaskan Malamute and the Siberian Husky, coming midway between them in height and weight, with no weight-pull stipulation. The Greenland Dog has to have heavy bone in its hindquarters, unlike the others with the same task in life. This is 'show dog wording' at its worst! 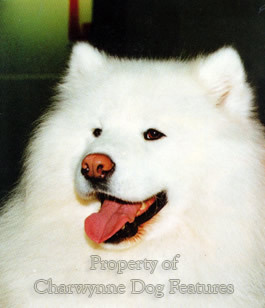 It's no help of course for the Samoyed to be placed in the KC's Pastoral Group, not in the Working Group with other hauliers, despite the KC acknowledging their sled dog ancestry but separating them from the others, so that are judged as sheepdogs or cattle drivers. 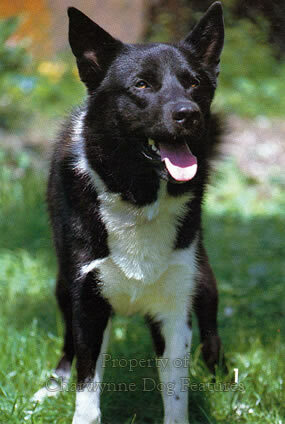 This could in the long term affect breed type; they could end up resembling the Lapphunds. They have to be pure white or cream yet the KC acknowledges their black-coated origin too; why limit the gene pool? 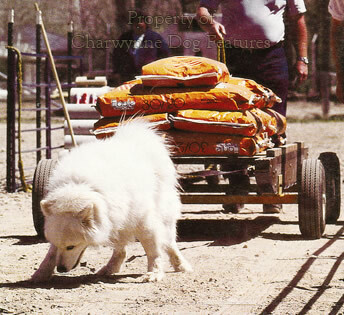 No words in the quite lengthy Breed Standard mention the great need for this breed to be built for hauling; in due course, this distinctive breed will become just another spitz breed and its origin purpose air-brushed from its design. Function will always dictate type and breeding for type distinguishes the breed. In 2015, in Britain, the future there of some sled dogs was apparent, with 521 Alaskan Malamutes, 842 Siberian Huskies, 25 Canadian Eskimo Dogs, 257 Samoyeds and no Greenland Dogs at all being registered. I doubt if the Canadian and Greenland dogs have a future in the UK; it may have been unwise to recognise them here, if the breed is to be properly supported - as I hope they will be. 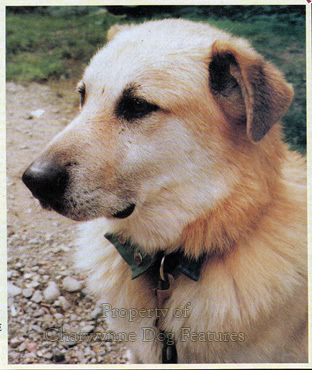 I believe that the surge in popularity of the Siberian dogs is rooted in a TV serial; that does no good to any breed. I see them tied to prams in shopping malls, no place for such a working breed. 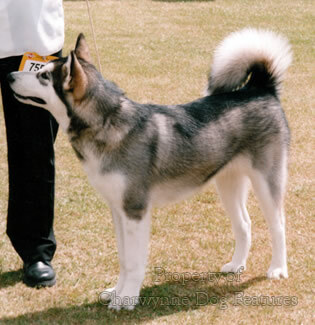 When I first saw the Alaskan and Siberian dogs at World Dog Shows I was greatly impressed, most of them were superb specimens; since then I have seen rings full of below average quality exhibits attracting unfavourable judges' critiques. It is gratifying to know that both breeds are exercised in sled dog races both over snow and cross-country. These dogs were bred in a hard school and deserve to be retained as true working breeds, especially in their anatomy. The wording of their Breed Standards will play a part in this. No doubt the show ring will dictate that sled dogs one day will be mainly valued for their coats, resemble flock guardians in size and grandeur and mirror the shepherd dog head. They will be traded on cosmetic grounds alone and as breeds not functional creatures based on demanding criteria. This will please the kennel clubs of the world and make veterinary surgeons richer but will not do much for dogs. There is a wanton disregard for hybrid vigour amongst dog breeders and contemporary dog traders have learned that the closed gene pool in recognised breeds has to be respected for commercial success. Breed specific diseases are largely ignored. 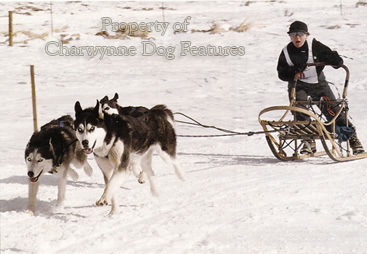 The sled dogs need sound feet if they are to function, with their breed standards varying too on this subject. The Alaskan Malamute has to have large feet, the Siberian Husky medium sized feet and the Eskimo Dog has to have 'rather large' feet. But whereas the Malamute and the Siberian Husky have to possess compact feet, the Samoyed should not have round cat feet. Most of the sled dog breeds that I see at shows have cat-like feet, very compact. 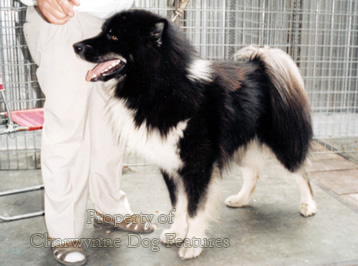 Another northern spitz breed, the Finnish Lapphund has to display oval feet, the Finnish Spitz is preferred with round feet and the Elkhound comparatively small, slightly oval feet. But does any judge look at such fine detail? What foot-shape suits the canine haulier? One fine day, the kennel clubs of the world will all agree that it is in the best interests of every breed, whatever their role, to be categorized or grouped so that they can be judged by those most knowledgeable with that sort of dog and for them to have a Breed Standard in which every word is intended to respect that breed's function!